We cannot know how far the ripples travel as we impact the life of another. May our impact be one of inspiration and kindness. Through her smile, love and faith, Grace E. Smith touched the hearts of many. She finished the race of life May 9, 2013, at twenty years of age, after a ten month battle with cancer. While the Sarcoma ravaged her body, it never touched her smile or spirit. Her choice to live in peace and hope for a future not only inspired her family and community but all who came in contact with her. Many said she inspired them, but their words of encouragement and praise inspired her. We saw firsthand what the power of inspiration can do for the heart of every man. Even in the worst of circumstances, a kind word or generous action of another can bring hope to the hopeless and light to the dark. After winning “Woman of the Year 2013” of Telfair County, Grace stated, “What has kept me going through this whole process is the support and love of the community.” She inspired others and they inspired her. It is this kind of inspirational spirit that has captivated our hearts. What her strength did for many, so did her faith. Through her surgery to remove a ten pound tumor, through six rounds of chemo and devastating news of only six months to live, her faith never wavered. When questioned about what the doctors said she stated, “So basically what they are saying is I am a guinea pig. They don’t know how to fix me. That’s ok. I never expected the doctors to heal me anyway. My healing is coming from God. I am not worried. No one else should be either.” With this confidence in her heart she lived her life to the fullest, and inspired many along her way. 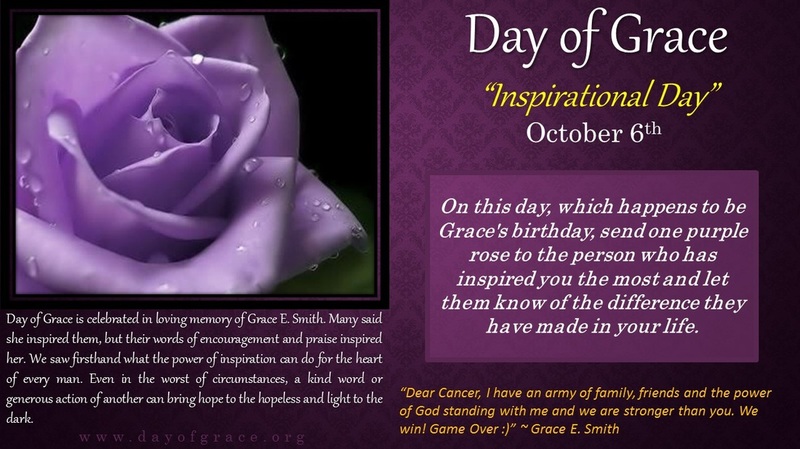 In her memory and honor, we are proclaiming October 6th, Inspiration Day. Please join in celebration with us by sending one purple rose to the one who has inspired you. This day is dedicated to demonstrating the value, power and strength of inspiration. May the act of giving or receiving a purple rose strengthen our resolve to make a positive difference in the life of those around us.